Almost everyone involved in the hiring process understands why it is so critical to find the very best candidate for a particular job. But few understand how to do it. Finding great talent is both more critical and more challenging than ever before. Giving you a huge competitive edge over all the other organizations out there, and the best possible chance of attracting and hiring the single best person for the job, your team, and your bottom line. Discover the hiring secrets for building a strong, powerful, profitable team … one person at a time! Almost everyone involved in the hiring process understands why it is so critical to find the very best candidate for a particular job. But few understand how to do it. People base hiring decisions on gut reaction or on a largely irrelevant set of criteria. All too often, the resulting employee is ineffectual, unmotivated, or simply not a good fit with the job they were hired to do — which can damage morale, team performance, and ultimately profits for years to come. 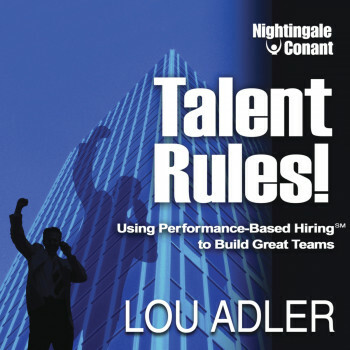 In Talent Rules, veteran headhunter and renowned hiring expert Lou Adler lays out a step-by-step system that will empower you to hire the right person every time. Lou's proven methods — which include detailed interview and assessment checklists and specific benchmarks — will enable you to evaluate a candidate based on measurable performance objectives, rather than your own impulses, and make consistently sound hiring decisions that result in a strong, cohesive team that operates at optimum levels. How to maximize the power of online sourcing channels like Google, Career Builder, Monster, etc. Finding great talent is both more critical and more challenging than ever before. Talent Rules will give you a huge competitive edge over all the other organizations out there, and the best possible chance of attracting and hiring the single best person for the job, your team, and your bottom line.